When I got out of court last night, all sweaty and out of breath, I was approached by a player who wanted to know whether the rackpack I had with me was suitable for squash. I was happy to show my bag (luckily I still had my stinking shoes on and not inside the bag) and to share my opinion, and in the shower it came to my mind that perhaps it would be a good idea to write a review of the rackpack. 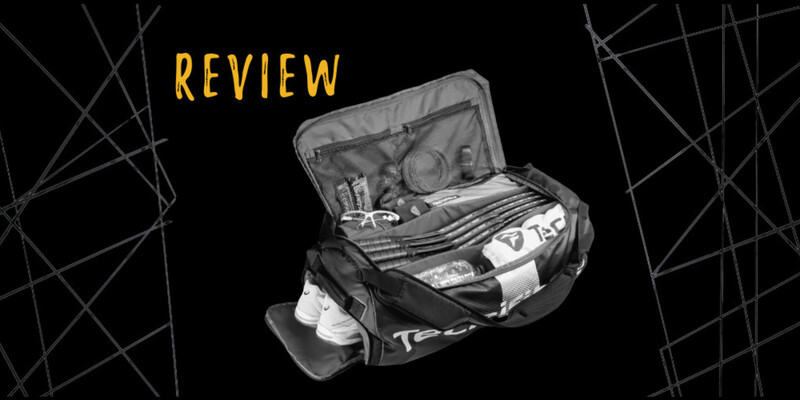 This new type of squash bag hasn´t been on the market for so long yet and it´s completely different to a standard racket bag you´re probably used to. 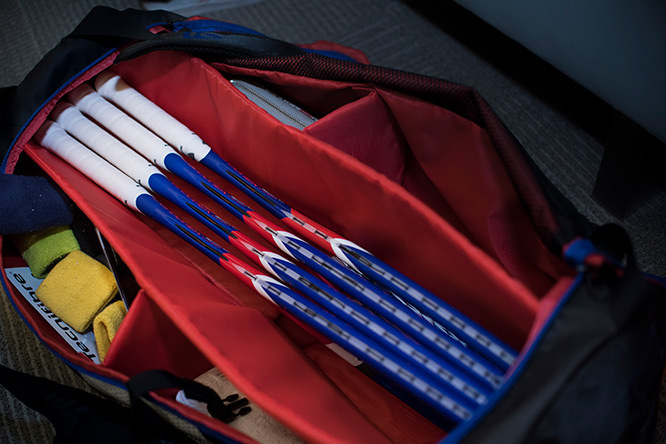 So, read on to learn more on the Tecnifibre Air Endurance Rackpack – it might be a good choice for you, too. Before the rackpack, I used to have 9 racket bags by different brands plus a backpack that I found comfortable in the summer. But after the Tecnifibre Air Endurance Rackpack came out about a year ago, I didn´t think twice about buying it. I´m a person who tends to lose all my belongings in the bag so I was excited to finally find a bag which allows you to see all your stuff at one glance. No more kneeling down in front of my car in search of the key! No more desperate search of a new grip in midst of a tournament match! The rackpack meets both of my most important requirements for a squash bag: it´s big enough for tournament use but allows me to immediately find what I´m looking for. As you´ve probably figured out, the Tecnifibre Air Endurance Rackpack has only one main compartment and you can zip it open at the top, so that you immediately see everything that is inside the bag. Now, you may think it must be a complete mess. Don´t worry: you can subdivide this main compartment into five smaller compartments and store your belongings separately in an orderly manner. If five comparments is too many you can choose to make three large ones. This is very easy: just remove the spacers attached with Velcro by pushing them aside. It´s an excellent system because this way you won´t lose them. These removable dividers are made of a thick and firm foam material which means that they stay in place and your rackets will be optimally protected. On the inside of the top of the Tecnifibre Air Endurance Rackpack there are also two handy ride compartments that you can look through and easily find what you are looking for. But I suppose nothing is perfect, and unfortunately the top hasn´t been reinforced at all, so it folds double and you have to hold the flap open with one hand as you take things out. This inconvenience would be easily resolved by reinforcing the top. There is also a zipper pocket on the outside of the bag, and it´s very useful for storing keys, for example. The 'Speed Ventilation' means that almost the entire side of the bag has air holes which guarantee optimal ventilation inside the bag. I love this because carrying and opening a stinky bag isn´t pleasant, neither for myself nor for the people around me. This 'Speed Ventilation' has also been applied in the separate shoe compartment where I shove my smelly shoes after the match. This box is so spacious that I can store my shower slippers on the top of my shoes. The 'Rip Stop Fabric' is another technology that distinguishes Tecnifibre from other brands. Basically it means that the material used in the entire bag is water-repellent and light to wear. To be honest, I haven´t tested the waterproofness of the rackpack. This is because if I see a single raindrop fall down from the sky, I - this is my confession - take the car instead of the bike. I know, very unsportsmanlike. But the fabric is light indeed. The bag doesn´t feel heavy even when it´s full. This is especially important if you play tournaments and have to carry a lot of stuff. Finally, the rackpack has an 'All In One Carrying System' which allows you to carry the bag in many different positions with a single shoulder strap, on the back or in the hand. Personally, I find that the most comfortable way to carry the rackpack is either on the back or over one shoulder. With the notches in the shoulder straps you easily pick up the rackpack to take with you, but in my opinion it´s not comfortable to carry it in your hand for a long time. The belts are too long and you have to hold the bag unnaturally high. That´s why in general I prefer my squash bag to have a lined handle on top, but with a rackpack that isn´t possible because you unzip the bag at the top completely. There is a handle on both sides, but it seems to me they are only meant to lift the bag, not to carry it. Until recently Tecnifibre was the only brand which developed bags especially for squash. Now there´s some competition by Unsquashable, whose products are exclusively designed for squash. In Tecnifibre, I still really like some details in their bags such as the small boxes designed to store balls. To sum up, the Tecnifibre Air Endurance Rackpack is godsend if you want to find your stuff in a blink of an eye. Rackets, shoes, accessories, snacks and drinks – all items have their own places, so you can easily check if you have everything with you. Other advantages are the excellent ventilation system and the separate and spacious shoe compartment. The only downside is the top of the bag that could have been made of a firmer material. The bag is nice to wear as a backpack and you can also easily hang it over your shoulder. It isn´t comfortable to carry it in your hand long distances, but after all not many players do that anyway.